Our in house designer, Sophie shares her top tips for creatives looking to branch into VR design. First of all, I feel like I should provide a bit of an introduction. My name is Sophie and I’m a creative designer at Harmony Studios. My role entails creating exciting content visualisations, interface designs and print media solely for use in augmented and virtual reality experiences. Working within the digital realities sector has provided me with a pretty concentrated knowledge of AR and VR from both a user perspective and a design perspective – a knowledge that I hope can help other creatives who may be feeling unsure about the do’s and don’ts of AR and VR design (in this article I will be focusing more towards VR). Before designing a VR app, experience or video we must ensure we are visualising content ideas in 3D. It sounds obvious – and to 3D designers it presumably is, but us 2D design folk can often get stuck in the habit of thinking every canvas is a 2D rectangle with four boundaries that we cannot cross. However, when designing for digital realities we must remember our canvas is a 3D space and that we can no longer presume our audience is going to be viewing it from a fixed perspective, nor should we want them to. The beauty of both AR and VR is that we have the ability to break down the wall between the user and digital content and build a more real feeling and responsive bridge between the two. Is there a presumed direction the user will be looking? How long will they be drawn to a point of interest before the focus changes? Will the experience simulate a directional movement (E.G walking) or is the user stationary? Will the 3D content be view able from all angles or only a specific range? In terms of creating a user experience journey and an interface design we need to assess the importance of the functions and information that will be required, and then prioritise where and how we show them to ensure they are received as intended, much like we would if we were designing in 2D. The only difference with VR is that we must also consider the role of head movement, motion paths, perspective and depth. Whether it’s creating a user interface to lay over an existing 360 experience or whether the project is still at the conceptual stage, it is key to identify the areas that the user’s gaze will be drawn to, or where we want it to be drawn to. 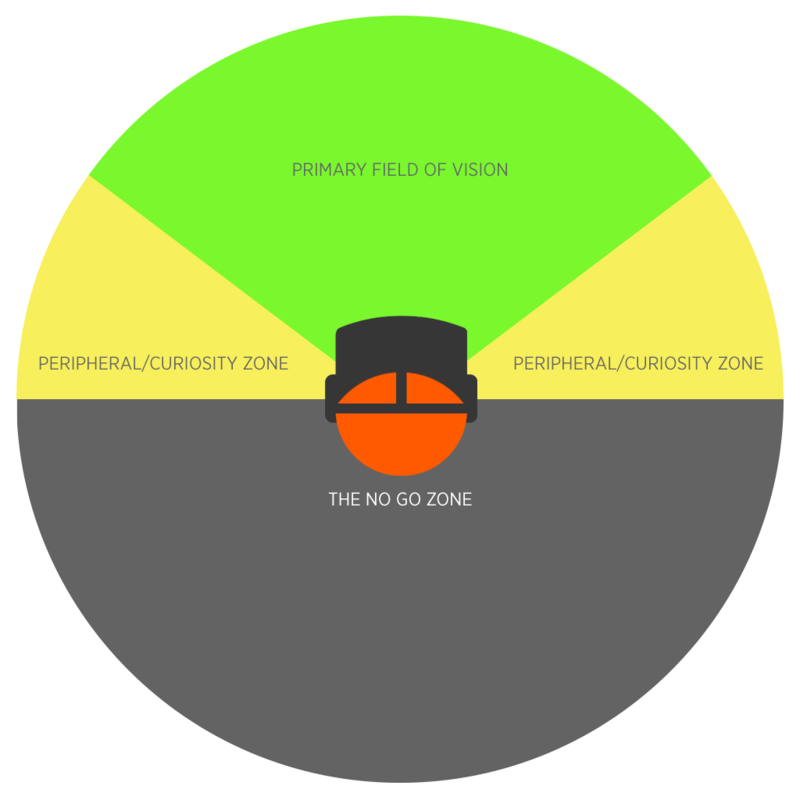 In the above diagram I have labelled an approximate primary field of vision for a headset user (in green). This is the field of vision we want any main action or vital functions and information to appear within, as generally this is where users will naturally be looking. Putting key content in or around this section will ensure users won’t miss anything. Once these points of interest have been identified we can then decide when and where to place the UI elements to work harmoniously with them and maximise impact and usability. Extra Tip: When designing UI for VR I recommend using a vector based design programme (Adobe Illustrator, Sketch etc) to ensure up/down sizing buttons or imagery won’t affect the visual quality. The reason I say this is because you will probably find yourself having to test and readjust UI placement and sizing a few times at first until you get a feel for what looks and works well in a headset view. Once we have ensured that the primary field of vision is being used as effectively as possible we can start to have more fun with the 360 space. The exciting thing about VR is that users can move their heads and look around their environment, so we may as well have fun with it (within reason). Creating a natural sense of direction for user’s eyes to follow works particularly well. We can do this through 3D content, transitions or moving UI elements. It’s important to try and keep movements relatively slow and minimal most of the time – we don’t want to disorientate the user! For example, showing content that moves in front of the user from left to right creates a natural eye movement that encourages users to turn their heads to follow the content. They can predict where the path is going to lead, so they adjust their head position almost instinctively. What is not ideal is using the peripheral vision areas sporadically and without logical purpose. If we dot content in the far left field of view, then immediately in the far right, the user won’t know where to look and will probably miss key action. Plus, it detracts from the immersive feel and the user will probably end up with a stiff neck! I think I have covered the first thing to avoid in my above point, but just to re-iterate – we must consider the placement, sequence and animation of content to make sure the user isn’t having to dart their head around constantly. The only exception to this rule is if a quick head movement is going to add dramatic effect and we want to draw user’s attention to a particular object very quickly (e.g a jump scare). This can be quite effective when used sparingly (especially when used with spatial sound, which you can read more about here). We just have to make sure that the content we want the users to turn to is on screen long enough for them to locate it, as they may have to look around a little bit to identify the point of interest. Secondly, something I can’t stress enough is not to put key content behind the user. I have marked the area I am referring to as the ‘no go zone’ on the diagram. It is not natural for a person to be able to twist their neck at a complete 180 degree angle (unless they are in fact part barn owl or the girl from the exorcist), so don’t bother putting much there other than what is necessary to keep up the 360 environmental illusion. AR and VR are still relatively new technologies, at least in regards to mass consumer markets. This has both pros and cons for designers. The first pro is that the newness of the market means there are few rules to follow in terms of what things should look, work and feel like. This is great for allowing creatives the freedom to innovate and experiment and also for gaining a truthful representation of how people react to content without too much influence from previous experiences. The con is that, with the new comes a lack of the old. What I mean by this is that there is not a lot of help available in the form of past work to analyse or learning resources to fall back on when trying to design for VR for the first time. My best advice is just to make sure you feel confident with the technologies you are designing for. If you’re designing a VR experience for a head mounted display, such as a Gear VR or Oculus Rift, test out the headsets thoroughly and get a feel for how they look and work through the eyes of a user. And that’s it! I hope this has been somewhat useful advice! Keep an eye out on our website and twitter for the next instalment of digital reality design advice where we will cover design tips for augmented reality content. Want to hire out VR Equipment? We rent out a range of VR equipment on our subsidiary website www.vr-equipment-hire.co.uk for professionals in need of VR equipment. We even offer 10% off for first time customers. Check out the twitter page for the latest deals, or give us a call if you want to discuss any requirements further.